The Alabama State Council on the Arts held its biannual Celebration of the Arts Awards ceremony on Tuesday, May 21, at the Alabama Shakespeare Festival in Montgomery. The event recognizes and honors Alabama artists and individuals for their contribution to the arts in Alabama and beyond. Al Head, executive director of the Council said, "This awards program is an opportunity for the state to recognize special individuals who make the arts happen and bring great credit to our state through their work." This year’s recipients included a Pulitzer Prize winning author, an internationally recognized poet, a professor emeritus and cultural historian, a university president and his wife, a dance instructor and artistic director, a playwright, a traditional band, a community arts volunteer and arts patron, and a long-time leader in the state legislature. Their contributions to the arts are diverse and far-reaching. Their impact on the entire state has been profound and sustained for many years. Lyndra Daniel, Birmingham—The Jonnie Dee Little Lifetime Achievement Awardee has devoted her adult life to supporting excellence in the arts as a volunteer, arts patron, and community leader in the state. She served on the State Council on the Arts for eighteen years and a term as Chairman. Rick Bragg, Piedmont—The Alabama’s Distinguished Artist Awardee is a Harper Lee Award recipient and Pulitzer Prize-winning author and journalist known for his nonfiction books, especially those on his family in Alabama. Bragg is currently a professor of writing at the University of Alabama and a regular contributor to Southern Living magazine. Dr. Wayne Flynt, Auburn—This Governor's Arts Awardee is a masterful storyteller and an award-winning author of twelve books examining religion, civil rights, education, poverty, and politics throughout the history of Alabama. He was the inspiration and long-time editor of the Encyclopedia of Alabama. He remains Professor Emeritus at Auburn University. Gordon & Geri Moulton, Mobile—These Governor's Arts Awardees have a passion for the arts and are avid collectors. They gathered support for numerous public art projects that include the Geri Moulton Children’s Park sculpture garden located on the grounds of the University of South Alabama Women’s Hospital. Their passion for all art forms led them to create the USA Glass Arts program and facility at the University. University President Gordon and First Lady Geri Moulton have served the University of South Alabama for the past forty-six years. President Gordon announced his retirement this year after serving in that position since 1998. Jean Prescott Pierce, Birmingham—This Governor's Arts Awardee has spent more than half a century volunteering her time, energy, and talents to the Birmingham Children’s Theatre. BCT is recognized nationally as one of the most highly regarded theaters for young people in the country. Mrs. Pierce has written countless plays and has been instrumental in the growth of BCT. 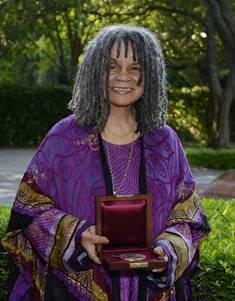 Sonia Sanchez, Birmingham—This Governor's Arts Awardee is an internationally recognized poet. In addition to being a Harper Lee Award recipient, an American Book Award winner, and a National Book Critics Circle finalist, Sanchez has received numerous other awards for her work as a playwright, educator, and activist. Kitty Seale, Montgomery—This Governor's Arts Awardee founded the Alabama Dance Theatre in 1986. Under Mrs. Seale’s teaching and direction, the Alabama Dance Theatre has gained regional recognition as an outstanding dance company and training ground for dancers. Excelsior Band, Mobile—The Alabama Folk Heritage Awardees have marched the streets of downtown Mobile for over 100 years in various Mardi Gras parades. The band plays Dixieland and conventional jazz for weddings, receptions, jazz funerals, conventions, and parades. The band celebrates its 130th anniversary in 2013. Senator J. T. “Jabo” Waggoner, Birmingham—This Special Council Legacy Awardee co-sponsored the legislation that created the Alabama School of Fine Arts in 1971 and has served the arts in the legislature and the state of Alabama for four decades. He currently serves as Senate Majority Leader. Prior to the awards program, a special reception was held in the Patron’s Room at ASF for the award recipients, their families, and guests. First Lady Dianne Bentley offered her personal congratulations to all the recipients at the reception. Jennie Weller created a buffet of beef tenderloin, and an array of other culinary treats. Elizabeth Schaum, special events manager at ASF, created the floral arrangements for the buffet tables and lobby. A dessert reception immediately followed the ceremony for the award recipients and a statewide audience of 600 in the lobby of the theatre. Honoree Rick Bragg was joined by his wife Dianne and Rick’s stepson, Jake Calhoun. Numerous fans of Bragg’s work attended from across the state to celebrate his latest achievement in a growing list of literary honors. Award recipient Lyndra Daniel of Birmingham was accompanied by her husband Bill and their two sons, Zachary and Christopher, and his wife Lucy. Many former Arts Council members were on hand to congratulate Mrs. Daniel on being selected for this noted award. The Legacy Award recipient Senator Jabo Waggoner was joined by his wife Marilyn, Mark and Susan Waggoner, Kevin and Lyn Kilpatrick, Rheana Scarborough, Sue Spears, and Andi and Mark Silberman. Past and present colleagues from the Legislature were on hand to congratulate the veteran senator. Folk Heritage Award recipients The Excelsior Band of Mobile had most of its members in attendance including Theodore Arthur Jr., Charles Hall, Leon Rhoden, Marion Ward, Carl Cunningham Jr., Danny Mosley Jr., Patrick Pettway, and Hosea London. Hosea London was accompanied by his wife Jerrlyn. Honoree Dr. Wayne Flynt was accompanied by his wife Dartie along with their son Sean. Special guests joining the Flynt family included Jeff and Carole Jakeman and Shirley and Kelly Thames. Governor’s Award joint recipients Geri and Gordon Moulton of Mobile were joined by Happy and Sherry Fulford and Dr. Joe Busta. Others on hand from Mobile to celebrate the Moulton’s award were Harold and Carlos Parkman, Patrice and Bro Baur, Ann and Lester Bridgman, Russell and Billie Goodloe, Joe and Penny Adamo, Laureen Lynn, Anita and Brother Toler, Deborah Velders, Kathy and Bob Shearer, and Donald Holmes. Awardee Jean Prescott Pierce of Birmingham was escorted by her two sons, Stephen and Adam. Others on hand to celebrate Mrs. Pierce’s award were fellow colleagues and associates from the Birmingham Children’s Theatre included Charlotte Lane Dominick, Camille Butrus, Sandra Lawler, Ginger Sharbel, and BCT Director Jack Lemmon and his wife Beverly. Special friends from Tallahassee, Florida, Pat and Fred Harris, made the long trip to be with Jean. Internationally known poet and Award recipient Sonia Sanchez, flying in from Philadelphia, was accompanied by her son Morani and Jeanie Thompson, executive director of the Alabama Writers’ Forum. Fans and admirers of Ms. Sanchez were on hand to congratulate her on being selected for this Alabama award. Montgomery favorite and award recipient Kitty Seale was accompanied by her husband Turner. Later in the evening Kitty was joined by her daughter Kate Robertson and Kate’s friend, Kevin Hagerson. Other friends and family of Kitty attending included her brother and sister-in-law, Frank and Sharon Litchfield, John Seale and Patti Williams, Susan and Jeff Samuel, Jane Barganier, and Alice McCollum. Noted VIPs were on hand to congratulate the awardees including First Lady Dianne Bentley’s executive assistant Heather Hannah, State Representative from Daphne Randy Davis and his wife Martha; Alabama State Treasurer, Young Boozer; Montgomery Mayor Todd Strange and his wife Linda; Former State Senator from Montgomery Larry Dixon and his wife Gaynell; former State Senator from Auburn Ted Little; State Senator Gerald Dial from Lineville; Supreme Court Justice Jim Main and his wife Gail; Frank White, director of the Alabama Historical Commission; Director of the Alabama Public Library Service Rebecca Mitchell and her husband Derick; Jamie McCrary, communications officer of the National Endowment for the Arts; and Armand DeKeyser, director of the Alabama Humanities Foundation, and his wife Torrey. Event hosts included Arts Council members Jim Harrison III (Chairman), Vaughan Morrissette (Vice Chair), Lisa Blach Weil (Secretary) and her husband Andy, Joel Daves IV and his wife Stephanie, Julie Hall Friedman, Ralph Frohsin and his wife Allyn, Dora James, Elaine Johnson, Selwyn Jones, Rebecca T. B. Quinn and her husband Bill, Lee Sentell, Ceil Jenkins Snow, Dr. Rachel Brown Fowler, and Doug Purcell and his wife Betsy. Former Council members present were Jim Inscoe, Lynn King, Emilee Lyons and her husband Alabama Supreme Court Justice Champ Lyons, Joe McInnes and his wife Sandra, Judge Vanzetta Penn McPherson and her husband Thomas, Bernice Price and her husband Judge John Price, Dyann Robinson and her friend Febreu Holston, Judge Jamie Sledge and wife Joan, Wiley White and her sister Jacqueline Floyd, and Linda Rochester and her husband the Honorable John Rochester, chairman of the Alabama Humanities Foundation. The evening’s entertainment began with music from Troy University Faculty Jazz Ensemble, Jazz Comes Home, under the direction of Ray Smith. Dancers Kate Robertson, Joy Ohme, and Casey Bailey from the Alabama Dance Theatre took the stage with vocalist Susan Cooper and guitarist Robby Gibson in a performance tribute to Kitty Seale, Governor’s Arts Awardee. Priscilla Cooper, Vice President of Institutional Programs, Civil Rights Institute in Birmingham, and Georgette Norman, director of the Rosa Parks Museum in Montgomery, recited poetry from notable works of Governor’s Arts Award recipient Sonia Sanchez. Actors from the Birmingham Children’s Theatre performed three vignettes from past BCT plays in honor of Jean Pierce. Mithril, a widely recognized Celtic/World music group from Mobile, performed “Ashokan Farewell” and favorite fiddle tunes of Geri & Gordon Moulton. The Poor But Proud Shape Note Singers performed in the Sacred Harp singing tradition in honor of Dr. Wayne Flynt, who also happens to be an ordained Baptist minister. Noted singer, songwriter, and music arranger Bobby Horton performed Mac McAnally’s “Back Where I Come From” and Stephen Foster’s “Hard Times Come Again No More” to recognize the down-home flavor of Alabama’s most published “Good Ole Boy,” Rick Bragg. Lyndra Daniel was honored by a large ensemble of young singers/actors from Red Mountain Theatre performing “The House that I Live In,” the song Lyndra performed in the talent competition at the 1962 Miss America Pageant. The Excelsior Band was honored with a performance by the Bay City Brass Band of Mobile, whose younger members were strongly influenced by the 130-year-old Excelsior Band. In honor of Senator Jabo Waggoner, Gaither Family Band gospel tenor Wes Hampton from Birmingham gave a stirring vocal performance of gospel songs he has helped make famous. The Celebration of the Arts Awards Gala is held every other year and is FREE and open to the public, but tickets are required. The next event is scheduled for May 2015.